Step 1: Choose Your Package • Step 2: Choose Your F&B • Step 3: Book Your Party! Please note, teachers are subject to availability. We will do our best to try to provide the right teacher and number of teachers for your event. The earlier in advance you book, the more likely the teachers will be available. For up to 10 children (with 20 adults). Parties with more than 10 children MUST reserve the Exclusive Package. For up to 40 pax (including both children and adults). Applicable children up to 4years old only. Baumhaus Café offers a variety of catering services in our coffee lounge to suit your celebration needs. You are welcome to bring your own birthday cake. There is no cake-cutting fee. What's a party without some nibbles? Our Party Food Package is equipped with snacks and bites to enjoy as you play. No party is complete without a few nibbles. Whether you’re looking for savoury brunch snacks or sweet teatime desserts, you can mix and match your party menu down to every detail to your satisfaction. All the singing and dancing can leave party guests in need of refreshment. Give them an extensive menu of adult and child-friendly drinks to choose from. 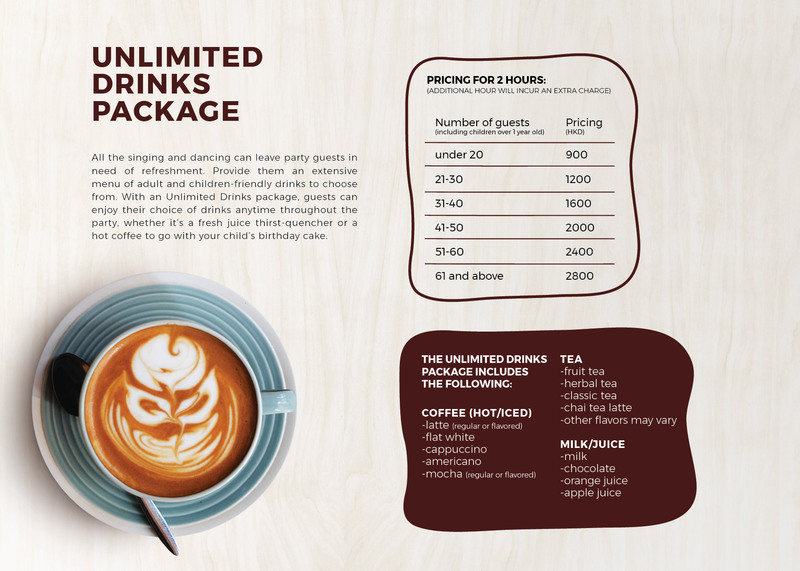 With an Unlimited Drinks package, guests can enjoy their choice of drinks anytime throughout the party, whether it’s a fresh juice thirst-quencher or a hot coffee to go with your child’s birthday cake. Our party packages cater for a maximum of 25 children and, for each child, a maximum of 2 accompanying adults per child. Alcoholic beverages are not permitted at Baumhaus during daytime events and parties. However, some exception can be made for exclusive parties. Party catering orders must be confirmed two weeks before your party date. In the event that you should have to postpone your party booking due to unavoidable circumstances, a minimum of 1 week notice is required, otherwise payment is forfeited. Baumhaus reserves the right to make the final decision. *Morning time slots on Public Holidays available on request. If your party requirements exceed our maximum number of children and adults, a package can be customised to suit your needs. In such cases, we request that you email us your ideal party arrangements. Exclusivity on the Day of a Party: If the number of children on the day of your party exceeds 12 and/or the number of adults exceeds 30 and you have booked the Open Party Package, we reserve the right to upgrade your party to the Exclusive Package. A fee of HKD 4000 will be due prior to the end of your party payable by EPS or cheque. In the event that you should have to postpone your booking due to unavoidable circumstances, a minimum of one week notice is required. There will be a HKD 2000 fee to reschedule. If the Food Package is cancelled later than one week notice, payment is forfeited.